Although you may think of Paris as the go-to city for indulgence, for pastries, red wine and cheese, there might just come a time when you feel in need of something a little bit lighter (yes, really!). When that happens, the City of Light has it covered: simply hit one of the nearby juice bars and top up your 5-a-day levels of tasty fruits, vegetables and vitamins in one delicious swoop. Top tip: The bar is just a stone’s throw away from nearby Canal Saint-Martin, so why not grab a juice to enjoy whilst overlooking the tranquil water? 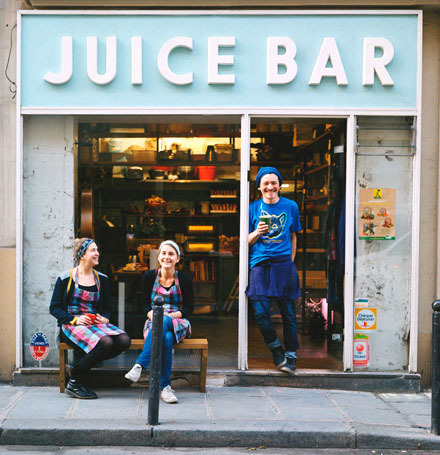 Top tip: Juice It is handily located right in the 1st arrondissement. The Paris you know from the pictures, the 1st arrondissement is home to all the big names of the city and is the ultimate place to watch the world go by as you enjoy a little boost of vitality. Top tip: BoJus is in the heart of Le Marais, a neighbourhood of Paris known for its medieval streets and labyrinth of vintage boutiques and second-hand bookshops. It’s a great area of Paris to base your hotel, experiencing the city as it once was. So there you have it, a delicious and fail-safe way to keep your body in tip-top condition in Paris, without missing out or denying yourself any of the good stuff. What are you waiting for? Bojus is def a must!! Wish I did that when I was there! I gained 3 pounds!! !